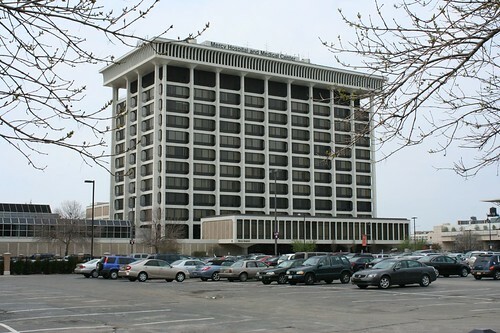 Mercy Hospital’s office tower is hard to miss when you’re flying along the stub of highway that collects 90, 94, and 55 and funnels them all onto Lake Shore Drive. It’s a decent bit of Onassis Modern, clean, spare and elegant. Within, it’s mostly hallways and offices and patient rooms, but a few bits stand out. 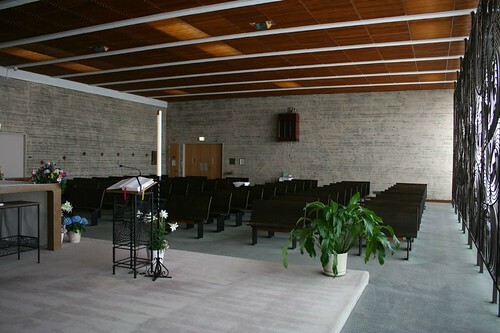 Like any good 1960s hospital, it has a wonderful chapel. By itself, the chapel is a simple and solemn affair, but it’s dominated by two spectacular works of art. 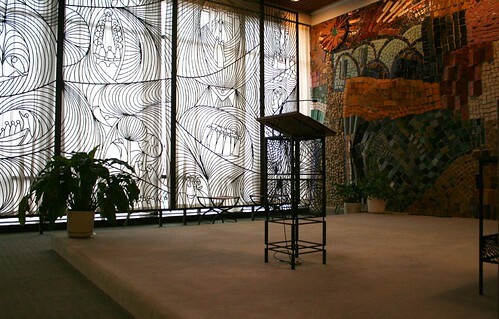 Against the east window wall, a metal screen represents major events in the life of Jesus in abstracted form. 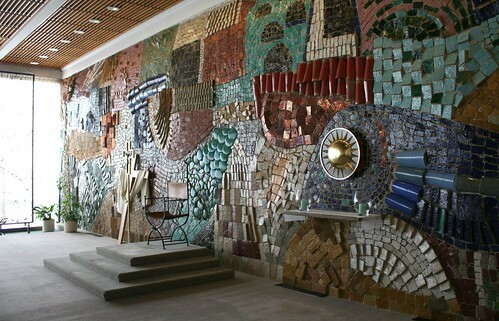 And in the front of the chapel, a purely abstract mosaic sculpture takes up the entire wall in an explosion of color, texture and material. Both works, along with at least one other sculpture in the hospital, are the creations of Nassio de Valencia, who finished them in 1967. 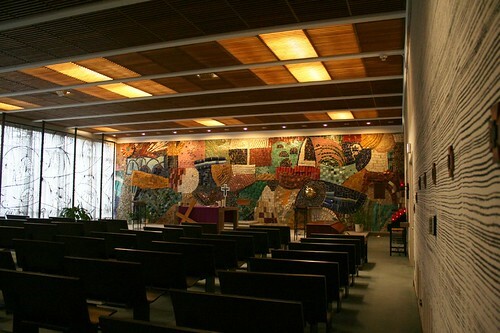 In a rare show of respect for artistic curiosity, his hand-written notes explaining the works remain hanging in the chapel today, neatly framed, explaining that the mosaic sculpture is meant to capture in purely abstract form the mystery of the risen Christ, as well as drawing from the native arts of the artist’s home in Spain. A few small details match the style of the window screen, such as the twin podiums and wall-mounted candelabras. Simple benches with leather seats capture the calming austerity of the place. 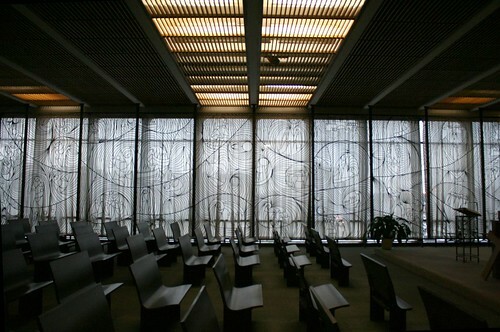 It’s an altogether fitting mood for a hospital chapel. Credit where credit’s due: I would likely never have thought to go looking for this place if the guys at Forgotten Chicago hadn’t idly suggested it. This entry was posted in Midcentury churches. Bookmark the permalink. These shots are awesome man! Do you prefer to fly solo? If not, hit me up, I'd be down to accompany you on a photo safari.